Born in Chicago on March 28, 1945, Carol Ronen has devoted much of her life to public service in Illinois. In 1967 Ronen graduated from Bradley University in Peoria, IL with a Bachelors of Arts in Political Science and went on to earn her Master’s in Public Administration at Roosevelt University in 1979. 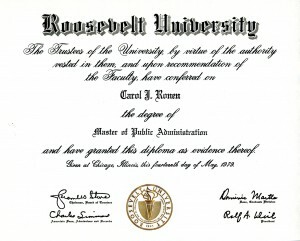 Carol Ronen’s Masters in Public Administration Diploma, 1979. Throughout her career, Ronen was highly recognized as a progressive public servant who advocated the causes of women, early childhood education, health care, violence prevention, and human rights. In Chicago, Ronen served as the Director of Research and Evaluation for the Chicago-Cook County Criminal Justice Commission as well as Director of Legislative and Community Affairs for the Chicago Department of Human Services. In 1989, she became the Executive Director of the Chicago Commission on Women where she created and facilitated programs that advocated for issues such as domestic abuse and welfare reform. 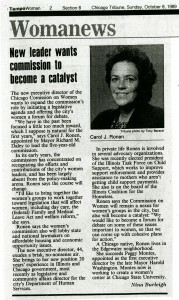 An article outlining Ronen’s goals for the Chicago Commission on Women, 1989. 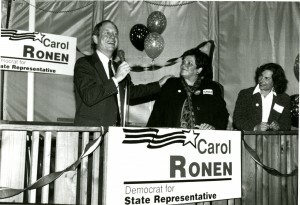 Carol Ronen served seven years in the Illinois State House of Representatives for the 17th District from 1993-2000. 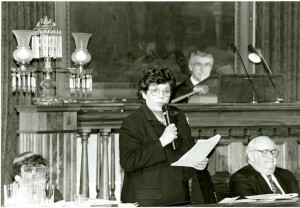 In 2000 she was appointed to the Illinois State Senate for District 7 after the resignation of her predecessor, Arthur Berman. Carol Ronen for State Representative Rally, n.d.
State Senate Elections Certificate, 2000. In the Illinois legislature, Ronen was a major advocate for LGBTQ rights. Ronen was a strong opponent of S.B. 1773, which sought to only recognize heterosexual marriage in the state, when it was proposed in 1996. Additionally, she was the lead sponsor of the Illinois Human Rights Act (2005), which protects Illinois residents from discrimination based on sexual orientation or gender identity. 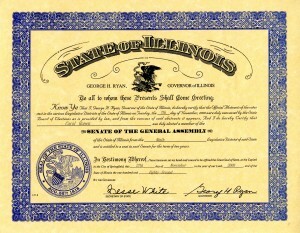 Passing this bill took over a decade of work and, according to Ronen herself, “fulfills a personal commitment I made when I first ran for office – to extend equal protection to Illinois gay, lesbian and trans-gendered citizens.” At the time this Act was passed, there were only four other states that had adopted such sweeping protections. Part of a speech given by Carol Ronen in opposition to S.B. 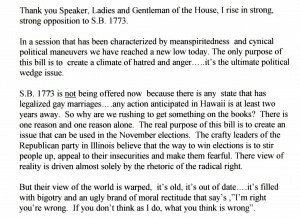 1773, which would have allowed only heterosexual marriage to be recognized in IL. Ronen was also a strong supporter of the Equal Pay Act, which increased the number of women covered by equal pay protections, and was a driving force behind increasing the Illinois minimum wage. In October 2007, she announced that she would be resigning as District 7 State Senator and would not complete her term. She officially stepped down on February 10, 2008, and was succeeded in office by Heather Stearns. Carol Ronen in the State Senate, n.d. The Carol Ronen Papers at the Women and Leadership Archives consist of 2 linear feet of materials and document the years 1952-2009. Additional papers at the WLA of women involved in politics include the Carolyn Farrell Papers, the Sheli Lulkin Papers, the Mary Ann Smith Papers, the Marion Volini Papers, and the Carol Mosley Braun Papers (currently unavailable for research). This entry was posted in Collections Highlights and tagged Chicago, Illinois, LGBTQ Rights, Women in Politics by Women and Leadership Archives. Bookmark the permalink.